Last year, for my birthday, I received a very special gift. My friend and former coworker Erin Ulrick - a talented designer - made me a lamp based on a design that I had seen online at Anthropologie's website. 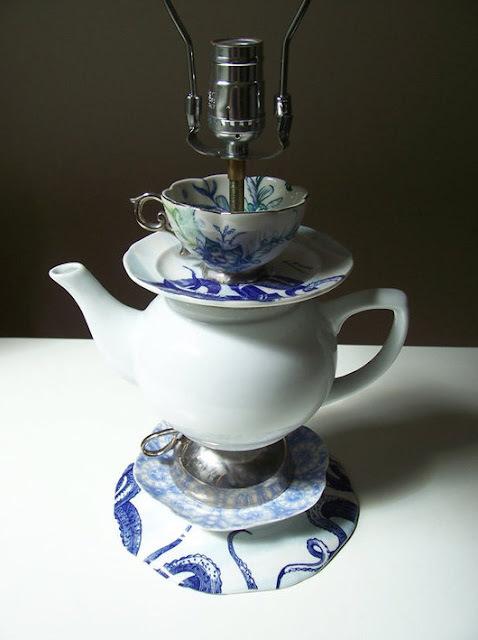 It was a lamp made from a collection of tea cups, saucers and a teapot. 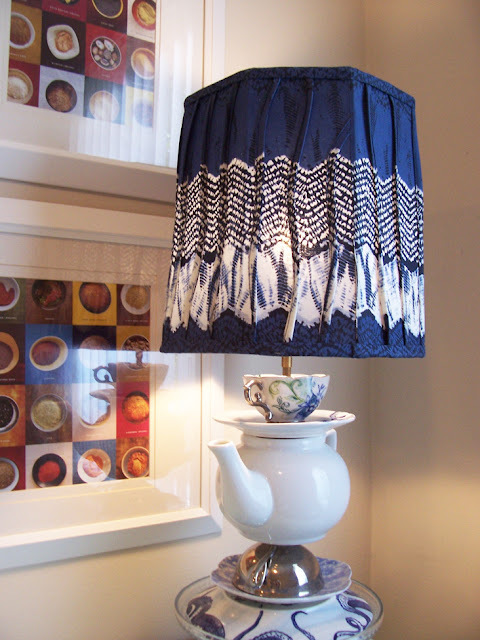 Since the lamp was not in stock at the store where I worked, and could not be shipped from the website, Erin adapted the design by using dinnerware she purchased from Anthropologie (From The Deep Dinnerware) and made the lamp herself! I was so impressed with the result. Just yesterday I purchased the lampshade - also from Anthropologie - and put the lamp on a small desk in my kitchen nook where I keep a lot of my files. 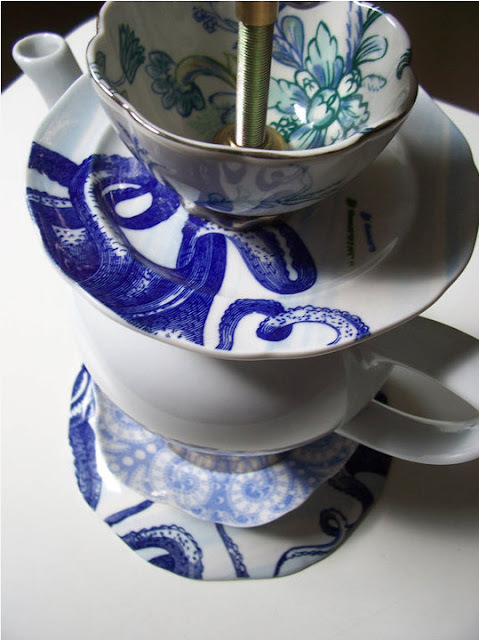 The cup-and-saucer theme fits perfectly into the kitchen and I love the blue and white motifs. A friend called it "Nouveau Victorian - in a good way." I wholeheartedly agree! To keep the bit cool while drilling you should keep a small cup nearby filled with about a half an inch of cold water. You can dip the tip into the water occasionally to cool it down. Don't push too hard, let the bit do the work. If you rush, the china may break. This step is extremely time consuming so be patient. Lamp parts are available at most hardware stores. You can buy a kit with all the parts you're going to need. It will come with a cord, socket, harp and threaded tube. Follow the instructions on the lamp kit on how to put the basic pieces together. Insert the tube through the drilled china starting at the top. When everythings in the spot you want put a washed and nut on the bottom to hold it all together. Now moving on to your electrical lesson! You have to leave the harp and the light socket attatched to the china but remove the top section of the switch and access the terminal screws. (Terminal screws are the little ones on each side of the switch.) Now thread the electrical cord through the tube. Split the cord about an inch to an inch and a half and tie a knot in it. (You tie the knot so you can't disconnect the cord.) Strip approximately 3/4 of an inch of the insulation of the cord exposing the bare wires. Make a loop in the end of the bare wires and attatch it to the light bulb socket in a clock wise direction. Push the upper section of the light socket onto the base section. Screw in a light bulb, plug it in and BEHOLD! 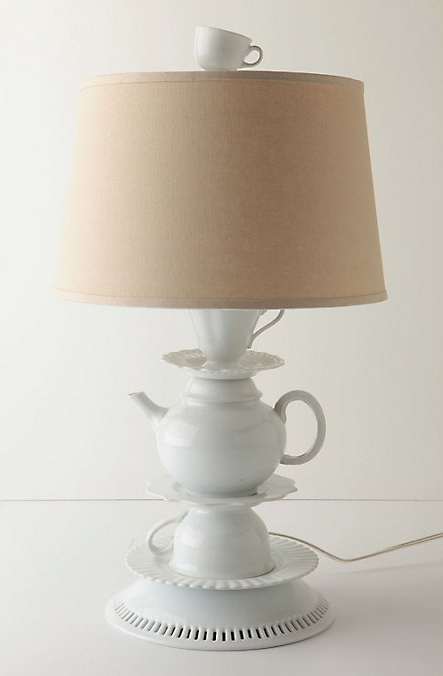 This lamp from Anthropologie was the inspiration for Erin's design. She used plates, cups and saucers that she purchased at Anthropologie to make her own unique version of it for me. 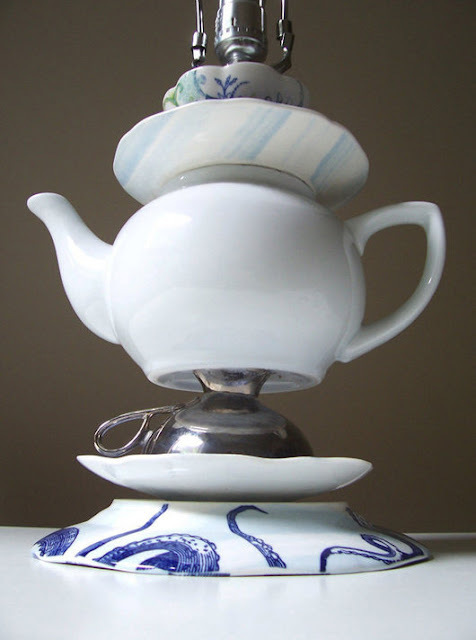 The teapot was purchased at a garage sale. I treasure this creation. What a wonderful gift. How clever Erin is. Wonderful! I often see things in stores and think; "I could make that myself!"... and then don't. Congratulations on following though! Thanks for sharing! It looks really great! Tell is it important what kind of lamp to use? I have this kind of lamp hardware.ch/bega and I think I can use it for project that is similar to yours. But I am not sure in its size. Tell me please, where did you get your lamp? Hi Scott, I believe she got the lamp parts at Home Depot. You can buy any size you want at most hardware stores. It is just the center rod, the cord and the light fixture and then you build the kind of lamp you want to build using your own materials. She used the tea cups and tea pot in this case, but you could use a lot of different materials, from wood to ceramics.